The ancient Allegheny Plateau formed from a long-ago regional uplift in the Paleozoic Era. Over the eons, rivers and minor waterways eroded the plateau to form mountainous terrain. The plateau arcs from central New York, through the top-half of Pennsylvania, dives though the heartland of Ohio and West Virginia, and terminates in Kentucky. Smack in the middle of this arc is Cherry Springs State Park in Pennsylvania. In 2008, due to its isolated location and 2,300-ft altitude, Cherry Springs State Park became the second recognized International Dark Sky Park in the world. 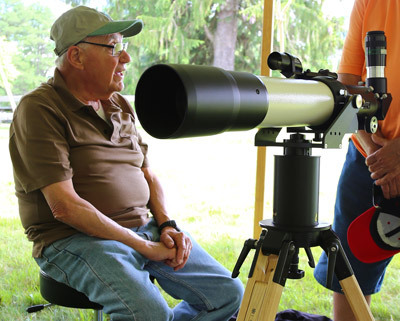 The Pennsylvania Department of Conservation and Natural Resources has developed the site for amateur observers with electrical pedestals, telescope pads, and even four enclosed observatories for rent. Albany, New York City and Philadelphia are less than a 5-hours’ drive — making it a destination for amateur astronomers escaping the light domes from these cities. 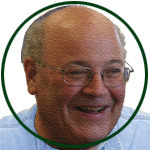 The site is popular enough with dark sky enthusiasts to host two star parties: Cherry Springs Star Party (CSSP) in the spring and Black Forest Star Party (BFSP) in the fall. 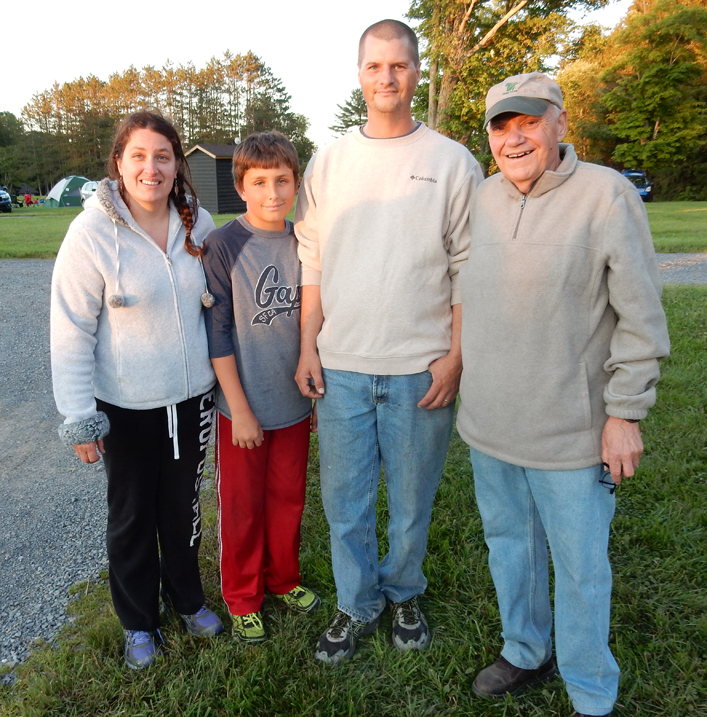 This year’s Cherry Springs Star Party ran from Thursday, June 22th to Sunday, June 25th. Here is my review of the event. I arrived late Thursday afternoon after a five-hour drive. The weather forecast was not good for observing prospects for the start of the party: rain falling from a solid cloud deck from Thursday afternoon until sometime around daybreak on Saturday. I found the folks I was planning to camp next to, and set up my tent quickly. 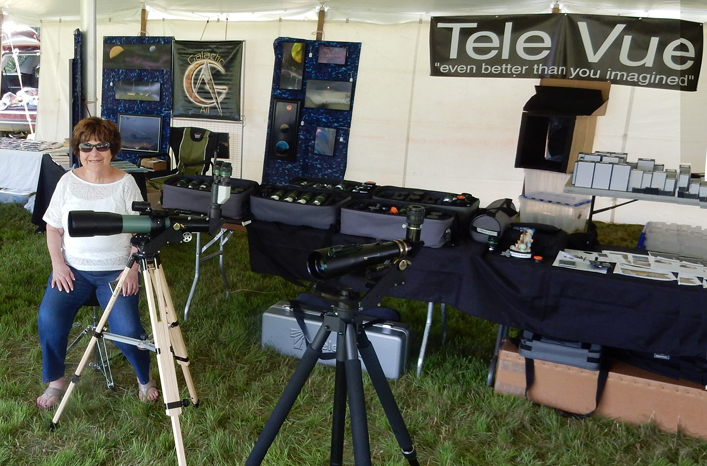 Judi Nagler in the Tele Vue booth surrounded by Tele Vue goodies! It was a cloudy-bright day with occasional showers. Traffic was light — I’d guess that the park was 40% full. Al and Judi Nagler were already in the vendors’ tent — having arrived from the nearby town where they were staying. I joined them and we demoed equipment and shot the breeze with the folks who showed up. Evening came with no prospects for observing. 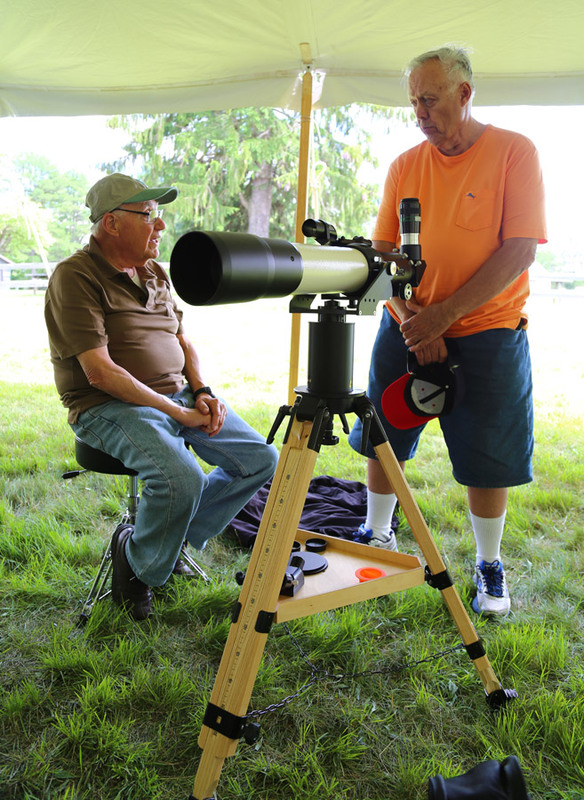 The Tele Vue NP101is scope on Gibraltar-HD4 mount is in the foreground while Al Nagler (sitting on an Air-Chair observing stool) chats with a fellow stargazer. I was awakened by sunshine heating up the tent. Poking my head out, I was greeted by “severe clear!” There were a lot more people around. I’m guessing that the park got up to about 80% full. People were coming in for the bigger day of programming and the one clear night of the weekend, and some staying into the next week. The vendor booth was much busier. During the day, convective clouds formed and the updrafts producing them created gusty winds on top of the gentle northwest breeze I’d been expecting. This resulted in a DOB I brought being blown over in one big gust and taking some minor damage. Al Nagler met this nice family. They said their license plate read “TELE VUE”! Meanwhile, our big project for CSSP was to try the new night vision monocular and adapter on a variety of our eyepieces and on scopes of different apertures, including my DOB. The neat thing about this unit is that it makes any DIOPTRX™-compatible Tele Vue eyepiece a “night vision” eyepiece, so you get your choice of magnification. For fast DOB owners there’s another big advantage beyond the obvious light amplification. Since the night vision monocular objective has a far larger entrance pupil than any human eye, it is essentially unaffected by shadowing from the secondary mirror regardless of the telescope-eyepiece combination. That means fast DOB owners can observe larger true fields of view than ever before and without wasting any of the objective’s aperture. For this testing, Al had recruited a number of observers who either were already set up within a short distance of where I was camped or would do so. Alas, the multi-scope test never came to pass mainly because a large number of people from the area showed up for the star party’s community outreach efforts. Pretty much everyone we’d recruited, including us, wound up doing outreach with their scopes instead of testing the night vision unit. But Al did get to use it with a Tele Vue NP101is and Josh Wright did get to spend some time with the unit on his 25″ DOB. 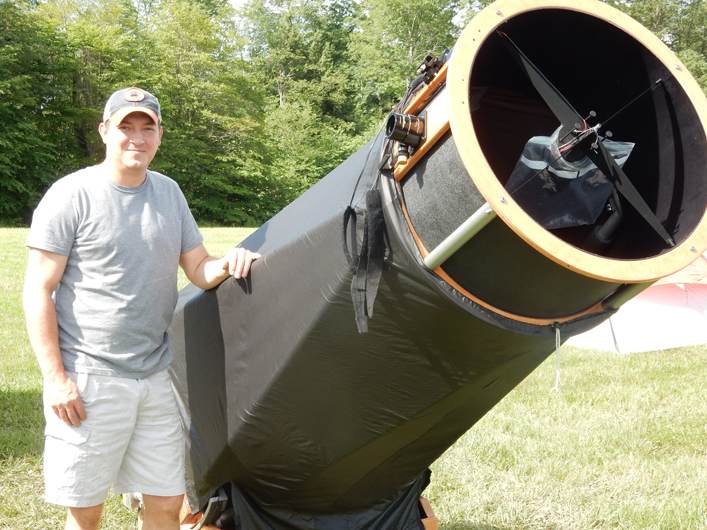 Josh Wright of Reading, PA with his 25″ f/4 DOB. He’d contacted us before CCSP to make sure he could try the Night Vision unit on his scope. Josh was one of the few people that did use the unit and he reports seeing the 2nd star in the Ring Nebula with it — a sight he’s rarely seen. I setup the night vision monocular on my Tele Vue NP101is (4″ APO). Wow! The wide-field views I had through this setup of the North American, Lagoon and Trifid, and the Crescent nebulae were seen in detail I had never seen before! I also participated in the outreach and was pleased at all the “Wow!” exclamations I got from family groups with their first views of Jupiter, Saturn, and Epsilon Lyrae (the “Double-Double” star). The cloud-free skies that night did highlight the only problem with the site: this year there was a fracking operation about 5 miles to the northwest which had work lights operating: so there was a light dome in that direction. Apparently, they aim these horizontally, rather than downward! I made it home after an uneventful drive, looking forward to future Cherry Springs Star Parties!